Through the end of the year, the 14-volume Gospel Advocate New Testament Commentary set is available from the Gospel Advocate online store for only $179.99 (Reg $229.99). No promo code is needed for this special holiday season pricing. 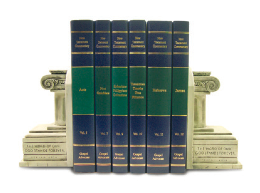 Our popular and time-tested New Testament commentary set is in clear, non-technical language. Verse-by-verse comments make it easy to understand and use. Written by highly regarded students of the Bible, all members of the church of Christ. 14 Volumes. Hardcover.